So without further to-do lets make a start with the main item – the jacket! OK… that’s it for the jacket – let’s start on those pocket contents….. The main contents are these compartmented pocket-sized plastic boxes and tobacco tin which are used to draw upon for various items on most trips. 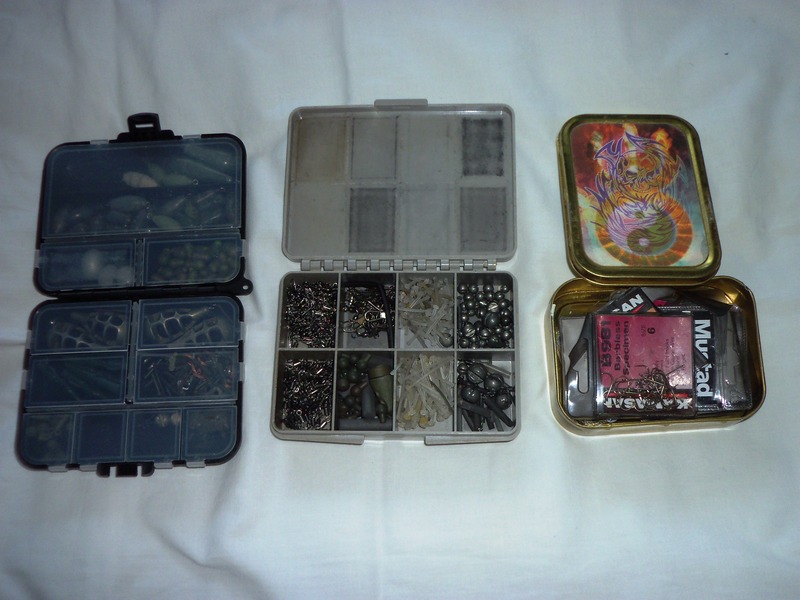 The plastic boxes contain various weights, Enterprise Adjuster-Stops, quick change link connectors, various large shot (2SSG + 3SSG mainly), swivels, and small (15mm) and large (30mm) Stonfo Bait Holders which are latex pieces that attach to the bend of the hook and are like hairs that can be attached/removed easily – not easy to find but can be obtained from http://www.pkangling.co.uk. 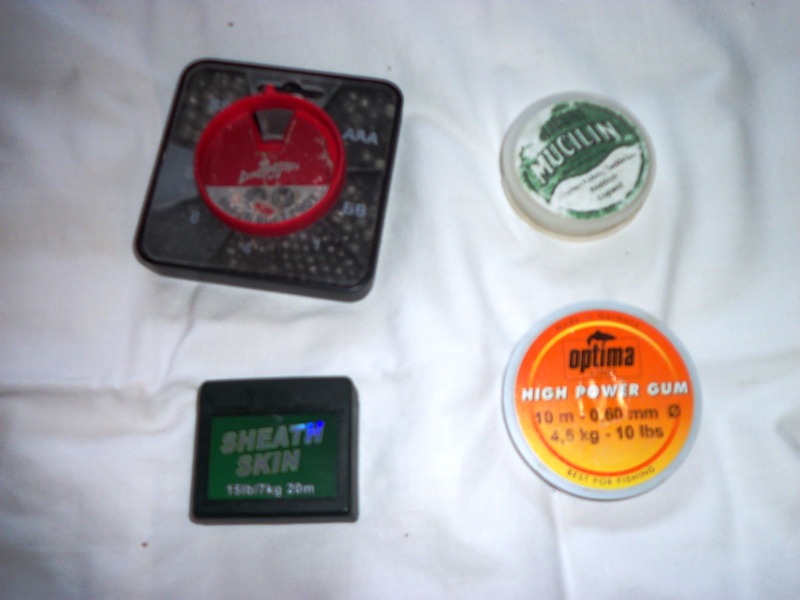 The tobacco tin contains my hooks – mainly Kamasan B981 barbless in sizes 2-16 although there are some Mustad Carp Maggot hooks and others down to size 20… basically the hooks smaller than size 16 are a throw back to my match fishing experience that I undertook for a year before deciding it wasn’t for me. My usual hook sizes I use for legering, freelining and floating baits fall between size 2 and size 6 on pools and rivers, for canal I usually look at 8-12’s for the same tactics and floatfishing anywhere it’s 12-16’s. Next items – above pic and from top row left to right – are plastic sleeve holding both mine and Liz’s licences and permits (why are the EA cards so cr*p? I laminate ours to prevent water damage), notepad with pen for quick notetaking (but generally only used if the next item is full or not available), Dictaphone for verbal notemaking (much easier than writing – and thus more likely to make notes), digital indoor/outdoor thermometer with clock display (outdoor probe is on a 3 metre lead to make throwing into water easy – clock is convenient for for reminder of hourly updating of temp records on the Dictaphone). And bottom row, left to right again… links for legers (ca 4″ long, 6lb nylon terminated with a swivel at one end and a swivel’n’snaplink at the other, the line being encased in shrink tube – helps prevent tangles on casting and also allows the running swivel to sit above soft silt if lead sinks down), back leads for canal legering (saves having to rewind/recast each a boat passes when canal legering as they hug the line to the bottom and the boats pass over without problem), cigarette lighter (various uses except lighting cigs as I don’t smoke! Eg shrinking shrink tube, melting tag ends of knots to create a ball to ensure knots do not slip, etc), tub of small beads (various uses), hook tags for pike fishing and for attractors on hooks of perch spinners), 2 made up link legers inc the attached leads. 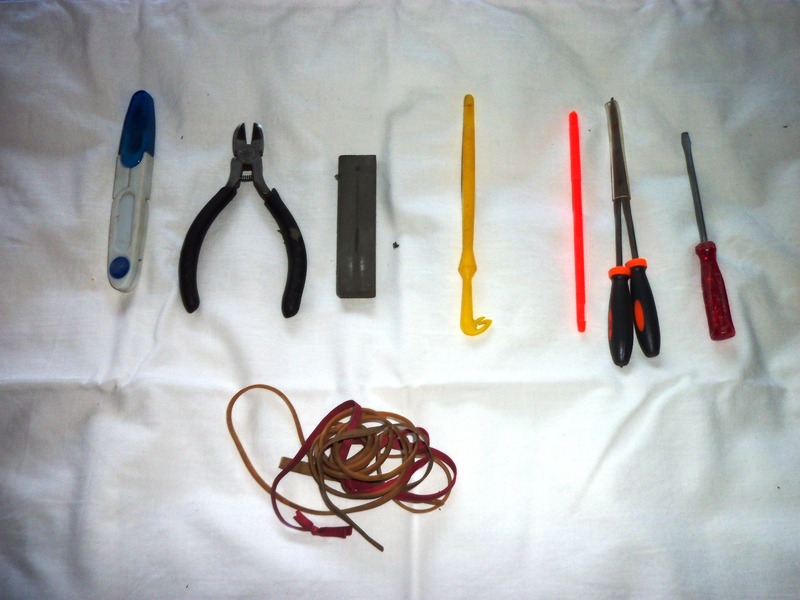 OK… here we have a pair of scissors, wire cutters, sharpening stone (for hooks and knife), disgorger/loop tier, spare disgorger, 2 small files (hook sharpening 2), small screwdriver – and a bunch of elastic bands that are cut into small pieces to keep live baits (maggots, worms) from wriggling free on barbless hooks. 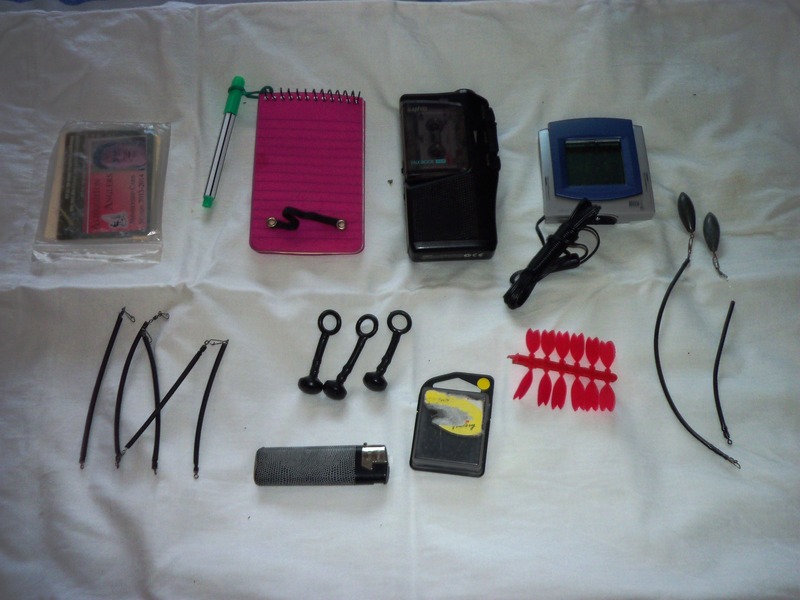 Next item is a black leather purse and its contents… ring clips (as used on bracelets – useful for adding things to the maninline without breaking all the terminal tackle down – just open sprung slider, slip on line – attach items to loop on ring), split link clips, meat spikes (add to hair rig, poke into meat and barbs hold meat securely), plastic pouch with small ordinary scissors, braid scissors, boilie drill, baiting needle, and needle threaders to aid attaching small hooks to line, bait pins (for hair rigging maggots – actually us older folks will recognise these as an item that’s done a ‘Listerine’ (originally a general antiseptic, then a floor wash, now a mouthwash – and the formula has never changed!) as they were sold in the 70/80’s as eyes for homemade floatmaking purposes!) and finally a selection of silicone rubber sliding float stops of various sizes which are also used upline when river legering to prevent crud catching on the line and being washed down to the lead and hook. Now we have a split shot dispenser (SSG to No 6, I think), Mucilin silicon to make line float, sheathed 15lb BS braid (various uses inc hook lengths), power gum (various uses). 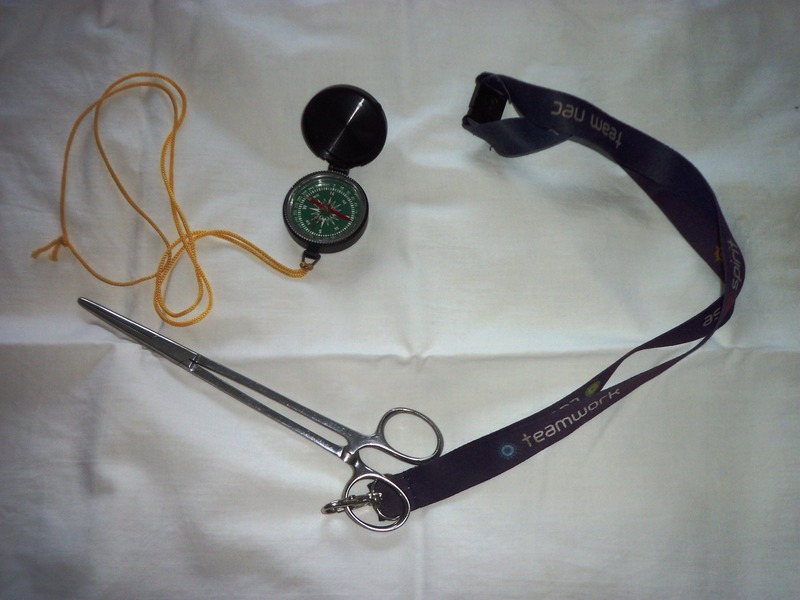 And finally – but not really ‘pocket contents’ as they are worn around the neck on lanyards are my forceps (unhooking) and a compass for determining wind direction, etc. And so there ends the ‘jacket’ saga!!! The failure was the Dinsmore’s threaded umbrella poles – on Go Outdoors site at £2.97 each (cheapest spotted elsewhere being £7+). Did a ‘Reserve and Collect’ for 2 of these last night, got an auto-confirmation back to say they’d contact me if the items were out of stock. Anyway, no e-mails arrived but just before heading out of house this morning I discovered a missed call from them on my mobile… so I ring them up and discover that the call had been to say that a woman had called to pick them up and they were checking that they were being collected for me… however, as I say, I missed the call (deaf and phone in hallway on charge at the time) and so in the absence of contact they sold them to her!! And no more in stock 😦 Saved a journey though, I suppose. Dunno about the GO ‘RnC’ thing at all though! – their systems are just not up to it! 4 times I’ve used it and 3 times been told items are out of stock despite showing in stock online… and the 4th time I’d seen a set of scales I liked in there on a visit but at £20 I ooh’d and ahh’d and left the store without them… got home and later that day decided I would get them and so did a ‘RnC’ online – only a little later to get an e-mail apologising that they were out of stock – which I thought strange as there were 5 sets on the stand earlier that day. So next day I went there anyway… and lo and behold on the stand there were still 5 sets!!! Tomorrow – off on the Staffie. A stretch I’ve never fished before *EVER* – and although I know where it is, I don’t know how to get there in the car – so looks like M. Poirot solving the case of ‘The Big 4’ will have to have a rest from being my bedtime reading for the night as I peruse Google and/or Bing Maps instead :D.
Well, I’ve decided to do my shopping for the brolly poles and the Korum 3-rod quiver tomorrow – deliveries allowing as Liz has an eBay item in transit to us… the guy who has sent it will be sending us the tracking details for the courier later this evening and hopefully it won’t be expected to get here until Wednesday. Saying this reminds me that I need to plan my journeys for the bus and trains (using the wonderful free pass that us ‘oldies’ get!) and print out maps of the locations for the walking bit. And Wednesday I’m planning to try drop shotting for perch on an early visit to the local canal. I’ve been watching YouTube videos of the technique (as this will be my first try at the technique) and have a sort of homemade version of the setup. Using my 8’6″ spinning rod, with 30lb braid mainline connected to a length of 10lb monofilament that contains the ‘works’ via snaplink – a size 2 long shank hook fitted via a custom Palomar Knot with an 18″ tail on to which is attached an 1/2oz bomb for the weight (fits on by snaplink so easily increased/decreased as necessary). By using the separate nylon trace and snaplink its easy to carry a selection of different weight-to-hook lengths or different hook sizes – the actual make-up being ‘fixed’ and the only way of adjustment would be to cut off the hook, etc and remake to the new desired length/hooksize. Just search on there for ‘drop shotting’ or similar…. Will probably aim to get to the canal around 6am and then wander for a few hours down and back up until the boats start to become a pain – usually about 9-10am. Talking about my jacket – I’ve had to empty my pockets to try to dry it completely as it was still damp I found earlier today from the Pwllheli trip – so I’ll try to take a picture of the full contents and explain it all in a post tomorrow as I said I would in the last posting…. Friday Liz and I are off out in search of tench….. But may go out on my own somewhere before then….. Session 16 – not where intended! OK… back from Pwllheli now…. Did have a days fishing – but not on the Haven Hafan Y Mor site’s pool as was intended. Arrived on site on the Monday quite early so we decided to have a walk about and ended up walking around the pool. Very weedy! Full of elodea (Canadian Pondweed) with the surface of the pool 95% covered by it and small clear holes. Liz saw a good sized (20lb+) carp jump – size verified by another guy walking the pool to whom we chatted. Seems this guy fished the pool last year and managed to land a 27lb’er but he said it was very difficult fishing due to the weed – lost a lot of fish when he was unable to get them back through the weed, even when using ‘dump leads’ (leads that fall off when a fish is being played). Anyway, we decided our strongest tackle would not be up to the job (1.75lb TC rods, 10lb line) on this pool and so we abandoned our plans to fish there. So, we needed to locate another place to fish if we could and we located 2 possible local fisheries – the Bron Eifion Fishery (http://www.broneifion.com/index.html) and the Eisteddfa Fishery (http://www.eisteddfa-fisheries.com/english/index.html) a bit further away. We fished 2 rods each – Liz fished spiced meat on one rod and swimfeedered maggot on the other, whilst I fished meat or bread on one rod, and maggot or prawn on the other. Results were fairly equal – all carp, nothing of size, best probably 1.5lb and about 8 fish between us. 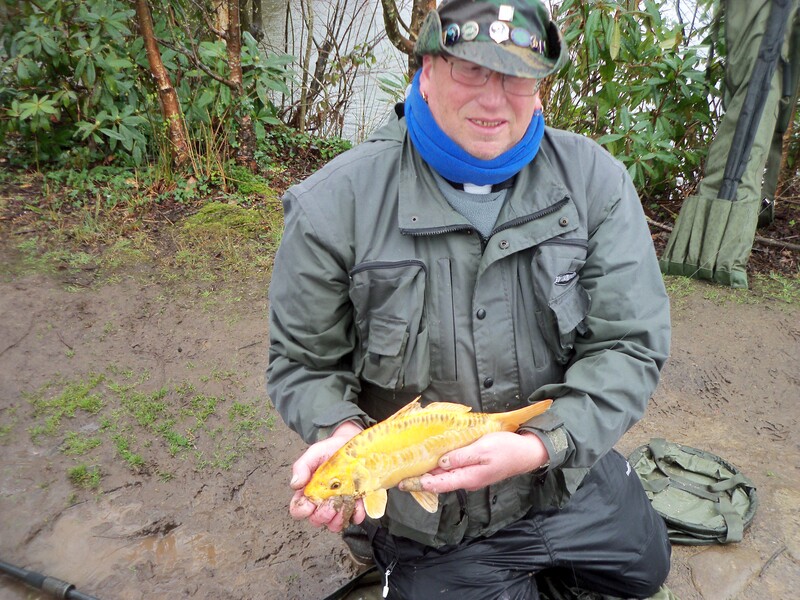 However, my last fish of the day was a bit of a special – a golden mirror carp of around 1lb. By the way – my clothes are NOT wetlook – just wet! And soaking to the skin! OK… so session 17 will take place some time next week – not sure when but I want to go to Go Outdoors in Coventry for a couple of screw-in-the-ground brolly poles and also hopefully get to Fosters of Birmingham to get a Korum 3-rod quiver – after which I’ll put my current Korum 2-rod quiver for sale on eBay. If you’ve not got a quiver then get one! 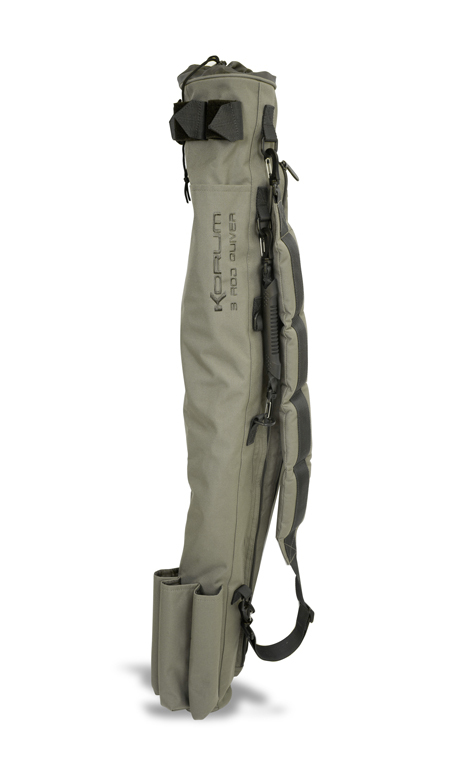 I’ve 2 currently in use – the original Korum 2-rod one which I use for stalking/roving on rivers and an Trakker NGX Captive 5-rod quiver I use for my more static forms of fishing. And intend changing the 2-rod quiver for the 3-rod version. Also Liz has made about 8 padded reel pouches (from some camo material purchased from Birmingham Flea Market for about £2, some lining material, velcro and soft foam) which allow the reels to sit inside and a flap wraps around the handle and fastens to the front of the pouch – which keeps the bale arm protected from damage and prevents the bale arms and handles tangling and snagging whilst in the car boot, etc. 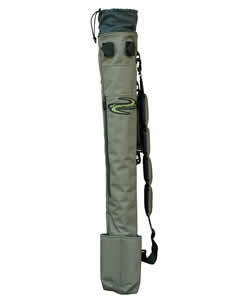 All the quivers also have a large central pocket for brollies/shelters and side pockets for banksticks/rodrests. The Trakker quivers also have a narrow pocket the full length of the quiver into which your landing net pole can be located – and this also acts as a stiffener/backbone for the quiver in practice. 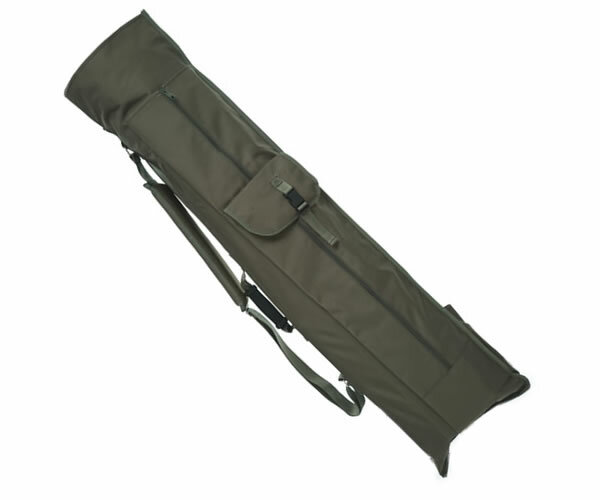 Also in favour of the quivers is the fact that, although rods can be carried made up, they don’t have to be… if you prefer to carry your reels separate then you can… but you still gain advantage of the ease of access to your rods as provided by a quiver in comparison to the usual need to unzip an entire length of a conventional holdall for that access. I must say that I don’t use the groundsheet though – too fiddly and really no loss of benefit by not using in my opinion. I’ve also added 3 guy ropes from the centre – and purchased some cheap but substantial tent pegs in order to provide stability in high winds. There is no centre ‘brolly’ pole that sticks in to the ground so it is anchored/secured to the ground usually just by tent pegs in the elastics around the parameter of the brolly but in higher winds the guy ropes add extra strength. far, far better than a conventional 50″ brolly for protection from the elements… no central pole to impede movement… cheap compared to a ‘day shelter’ (eg TFG Force 8 at £80+) and comparably priced with a standard brolly. Quick to erect – not much longer than a conventional brolly. CONS: heavy/bulky compared with conventional brolly and so not really suited to roving tactics – I use a conventional brolly for roving days – if I do take any cover at all that is. Not really suited to night fishing or long term sessions (more than a day) when a conventional bivvy would provide much more comfort, space and shelter. 2. My rod pod… again from Dragon Carp Direct for £20. The main factor we like in these is the stability – (a) having double vertical bars on to which the cross/buzz bars fit prevents those buzz bars rotating, something that happens regularly with single verticals regardless of how tight you lock them and (b) they are heavy enough to be stable and not move when one rod is lifted causing the other rod to bounce out of the rests BUT not so heavy as to make transit a burden and (c) each leg is adjustable so that whatever the ground is like the pod can be set up with the rest levels and stable very quickly due to the use of clip type friction locking (open latch – adjust – close latch). These particular pods are not adjustable in length ie the bar that connects front bars to back bars is one-piece – you can get ones that do from other sources/makers using the same hollow ‘delta’ shaped tube (gives light weight to high strength ratio) but these can cost over £100 – and to be honest we’ve used our pods with rods from 9′ to 13′ (but our usual rods-on-the-pods are 11′) without any problems at all. So – cheap, robust, and of optimum mass to remain firm in all situations we’ve used them in over a good 12 months of almost weekly use. Oh, and the price includes a carry bag too! To be honest, its a very tight fitting bag and the seams and zip do tend to be under strain – and recently both our carry bags failed – mine with the zip, Liz’s at a seam… but with Liz’s sewing machine skills she’s created me a new, slightly bigger bag, from the canvas of an old carp bedchair … and is to do the same for herself. However, I say just treat the bag as a ‘freebie’ – at £20 the pod on its own is well worth that! At £20 RRP this is a great item! And by shopping around can probably be purchased for less than £18. Basically, it is a bag in which you can transport sundry items of tackle (eg landing net head, collapsible buckets, a keepnet if you use one (I don’t), etc) to the waterside ready for your days fishing… and once there the base of the bag is padded allowing use as a unhooking mat with side walls of 2″-3″ surrounding to prevent the fish from flapping out. 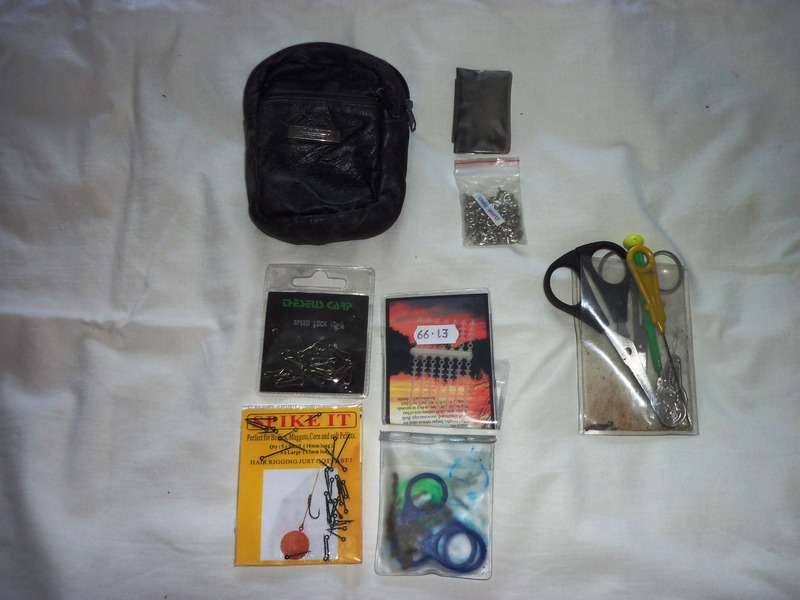 Also, if roving, its easy to drop your baits and sundry tackle items inside, zip up and move to the next swim, unzipping and baits and tackle items are at hand with unhooking mat ready. 2 short strap handles and a longer shoulder strap and a light weight make it very easy work to carry with you. OK! OK! Enough for today!! Really, with the exception of large items (rods, nets, chairs, baits, etc), I could go fishing for a whole day wearing just my jacket… and that includes several changes of tactics too. 17 pockets – and I think each one has its own contents from hooks, weights, disgorgers, rubber bands, rubber tubing, etc, etc 🙂 But as I say, that’s for another day! Session 16 will hopefully take place next week…. in Pwllheli! We’re booked on a Monday-Friday break at the Haven Caravan Site (Hafan Y Mor) there – and the site has a free-to-use fishing lake which is stocked with quite a few species of fish – carp, tench, perch, pike, bream, etc. – and we are intending to have at least one days fishing on there – and I may get to have a couple of short morning/evening sessions there too hopefully. Currently trying to get tackle into a small a space as possible as we’ll also need to take clothing and bedding and food along too. May have to fit roof box but hopefully will get things organised so all will fit in the back of the car. But unable to start doing that until tomorrow afternoon as we have a previous engagement to attend to that requires the boot space in the morning. As I’ll not have access to a PC – will take the Android tablet but on-screen keyboards are a PAIN – the results etc of session 16 and any others will be added on my return. 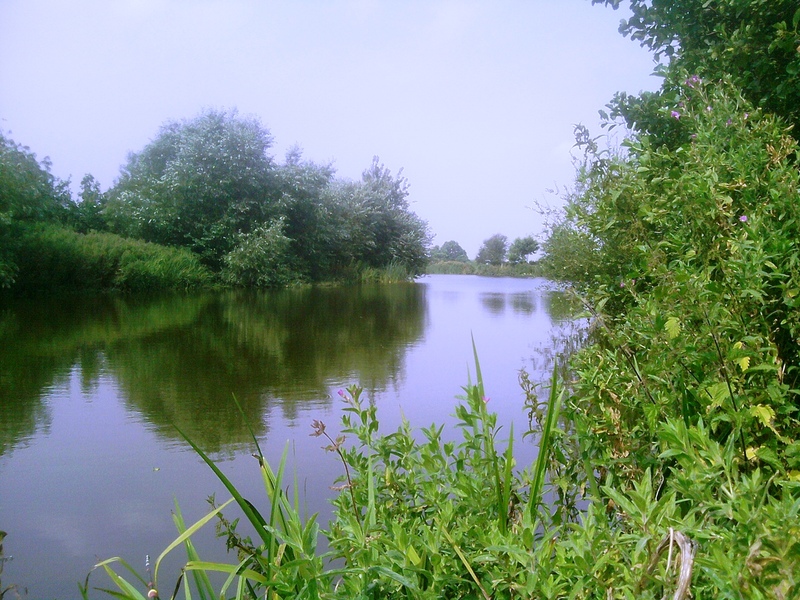 Session 15 – in which Steve blanks again but Liz gets a new PB tench! Anyway, back to session 15. The day itself was quite pleasant but could have been improved by the cold northwesterly breeze abating a little. Fished from 8:30am to just after 2:30pm with Liz’s fish coming in at 2:00pm. I fished 2 rods – 1 with bread on a size 6 hook and 1 with maggot on a size 12, Liz fished 2 rods – one with swimfeedered maggot which the tench was caught on, the other baited with chili meat. Slight upset on the day for Liz – after taking the first cup of coffee from her flask, the catch on the stopper didn’t close properly and, unknowingly, the remainder of the coffee seeped away when the flask fell over on the ground… she did have a couple of cups from my flask though bar mine was black and sweetened with Sweetex (Liz is normally a ‘white and 2 sugar’ person). 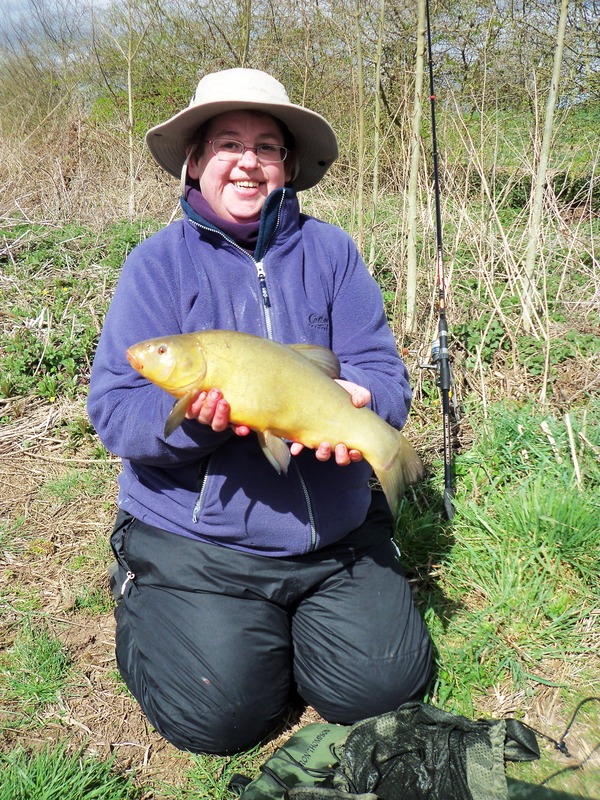 Finally, a couple of pics of the pool and location thereon that we fished at, and one of Liz with her new PB tench. Note that the pic of the pool was actually taken last summer hence the abundance of lush greenery whereas currently is it more barren and brown dead rushes having not yet started from the past few weeks of harsh weather….